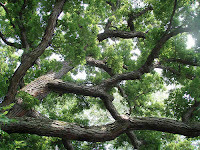 I have an oak tree in my back yard that is approximately 75 years old. 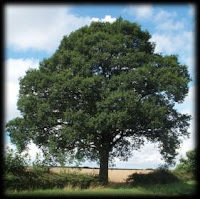 A tree surgeon told me about three years ago that is relatively young for an oak tree. He said they live anywhere from 200-400 years. Thinking he was shooting the breeze, I had to look it up online to discover he was correct. This oak in my back yard is about 80 feet tall. It is tremendous. Unfortunately, it was damaged during Hurricane Katrina three years ago. One huge limb broke and was dangling down. I had to pay someone $75.00 just to go up there and cut off the limb. The tree surgeon said the tree needed to come down after I had him inspect it in 2005. He said the root system has been irrevocably damaged and the tree would slowly start losing limbs before it completely falls down, which could damage my house. I just couldn’t bring myself to cut down this old majestic tree. It still had leaves growing on it. But, this year I noticed they were far fewer than in years past. The decision was made for me Sunday night about 9:30PM. I heard a loud pop that you could have heard a half-mile away. I looked out my back door and the entire tree had almost completely collapsed at the roots toward my drainage ditch. Thankfully, it didn’t fall toward my house which was about 70 feet away. The decision was made for me. I let it go longer than I should have. I was just hoping against hope it could somehow regenerate itself. It was not to be. It will be trimmed of all branches, then completely cut down and sold as firewood. It’s just an ignoble end for such an old warrior that was a sapling about the time my mother was born. It had survived many hurricanes. But, Katrina proved to be too much for it. Sunday night, it could stand no longer. This morning about 9AM, it will meet its fate at the hands of the chainsaw.